Japan Accident Renews Focus On Spent Nuclear Fuel In U.S. Since the U.S. nixed plans for a permanent storage site in Yucca Mountain, radioactive used nuclear fuel rods are continuing to build up in cooling ponds at U.S. reactor facilities. These pools, which generally aren't housed inside containment buildings, are considered a weak link in the safety of nuclear operations. The nuclear accident in Japan has rekindled debate about what to do with used reactor fuel. The Japanese power plant housed tons of highly radioactive used fuel in pools filled with water. Some of that water either leaked out or boiled away during the accident, putting that fuel at risk of burning and releasing radioactive material. With similar fuel pools at more than 60 reactor sites in the U.S., there's renewed interest in their safety. Once it is removed from the reactor core, used nuclear fuel is stored underwater in large swimming pool-like facilities. Once they cool off, the rods are sometimes stored in concrete and steel casks. Spent nuclear fuel pools are located in or near the building housing the nuclear reactor core. Space in these spent fuel pools is filling up across the U.S. as more nuclear waste is being generated. Dozens of spent fuel rod assemblies can be stored in dry casks, like the ones here at the James A. Fitzpatrick nuclear power plant in Scriba, N.Y. The uranium fuel in the core of a nuclear reactor creates heat and power for about five to 10 years. 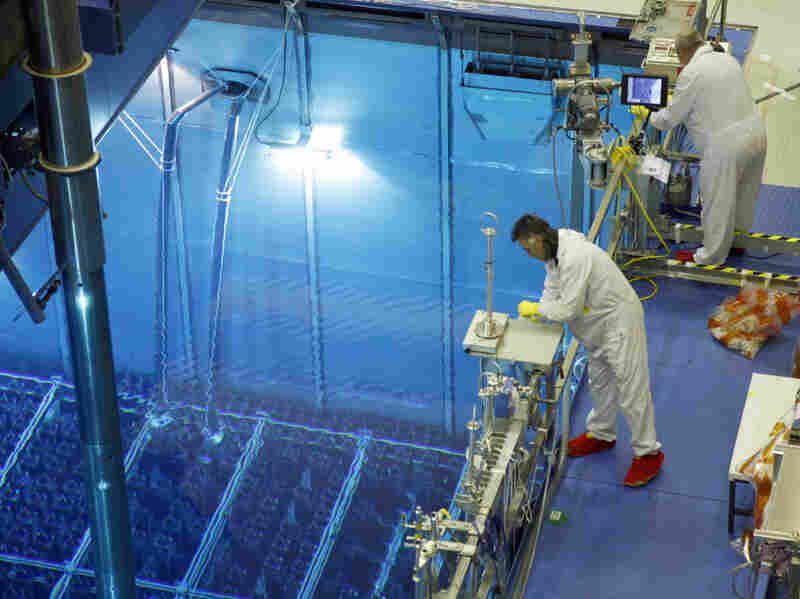 Plant operators then transfer the used fuel rods, which are still hot and radioactive, to a nearby pool. In Japan, the pools lost cooling water, the fuel overheated and was probably damaged. The event highlights the fact that the U.S. has lots of used fuel in similar pools, waiting to be disposed of in a permanent repository. At a Senate hearing on the Japanese accident, Ernest Moniz, a physicist at MIT, said the country has never really grappled with that fact. "I would say the storage of spent fuel between the reactor and the presumed repository has been an afterthought," he said. "It has not really been part of a serious policy discussion about fuel cycle design." The "presumed" repository was Yucca Mountain, a complex of underground tunnels in Nevada that was decades in the making. The Obama administration has decided not to use the site. During the long debate over Yucca Mountain, power companies continued to put more fuel rods in pools. Once they cool off, the rods go into concrete and steel casks and are stored at the reactor sites. Gregory Jaczko, chairman of the Nuclear Regulatory Commission, told the Senate that this stopgap system isn't perfect, but it works. "Right now, we believe that for at least 100 years that fuel can be stored with very little impacts to health and safety," Jaczko said. Most nuclear critics agree that the casks work well, but the pools remain a weak link. 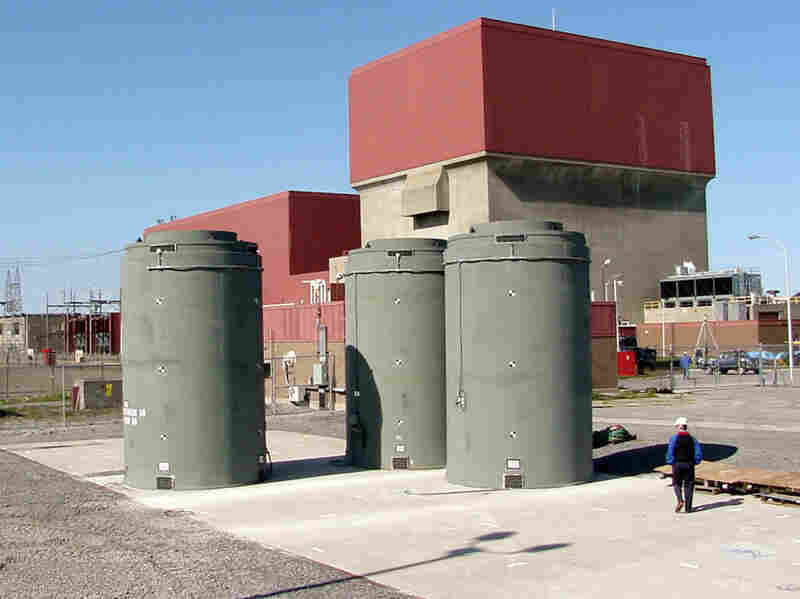 Former nuclear engineer David Lochbaum, who is now with the Union of Concerned Scientists, testified that "at all U.S. reactors, the spent fuel pool is housed in less robust containment than what surrounds the reactor core. More irradiated fuel that is less well protected and less well defended is an undue hazard." Spent fuel pools are not generally housed inside concrete containment buildings, as reactors are — they're inside an ordinary building. And as used fuel accumulates, reactor operators have had to pack the rods closer together in the pools, which requires even more cooling. At Xcel Energy, nuclear affairs chief Terry Pickens says reactor operators had to do this because the federal government failed to keep a promise it made to power companies long ago: to take their old fuel by 1998. "We were able to get it where we thought we could make it to 1998, and they are still not performing," he says of the U.S. government. "And now we still want to refuel and operate our reactors, so we have to make more space in the pools." Pickens and the Nuclear Regulatory Commission say the pools and casks are safe, but it takes a lot of juggling to cycle the fuel rods through the pools and into the casks at the right time. That's an expense that electricity consumers are paying for. James Conca, a geophysicist at the Hanford nuclear site in Washington State, says the government needs to change the status quo. "Come up with a strategy for how you go forward," he recommends, "because you really can't go forward with nuclear anything until you make this decision: Where are you going to put your waste, away from the environment, away from humans?" The White House has appointed a panel of experts to do just that: find a place to put used reactor fuel, as well as old bomb-making waste. Conca has testified before that panel and argues that salt deposits are the best place for a permanent dump site. Currently, the government operates the country's only underground nuclear repository in salt deposits in Carlsbad, N.M. The panel spent several days visiting the site earlier this year, and they're set to make their preliminary recommendation in July. Spent Nuclear Fuel In The U.S. Without a centralized repository for spent nuclear fuel, rods are accumulating at reactor sites across the country. Most of these fuel rods are being stored in spent fuel pools. These large water tanks don't have the same kind of radiation shielding structures that the nuclear reactor cores have, but the used rods in them are far less radioactive than new fuel rods. Below, a state-by-state look at how nuclear fuel is being kept.